Amazing Spider-Man Brand New Day Vol. 4 has more pages than worthwhile story – AiPT! So full disclosure, I signed on to review this book without realizing just how much content was in it. Covering issues 592-601 of Amazing Spider-Man, an annual, an issue of Amazing Spider-Man Family, the three issue Dark Reign Mister Negative series, eight one-shots from a number of superstar artists and writers, and a partridge in a pear tree, The Amazing Spider Man: Brand New Day: The Complete Collection Vol 4 is not a quick read. Unfortunately, it’s not a consistent one, either, as though there are a few winning stories peppered throughout the more than 500 pages that comprise the book, there are more than a few duds to be found within as well. The first thing that readers should know going into this trade is the time period they are dealing with, because the series takes place during the Dark Reign storyline that pretty much defined the Marvel landscape for most of 2009. 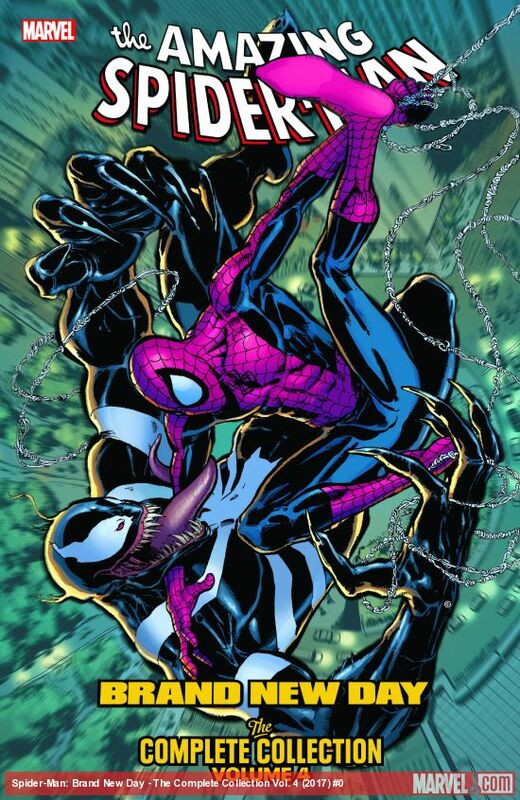 If the ensuing nine years have somehow made you forget just what was happening in the 616 at this time, this is coming out of the aftermath of the Secret Invasion storyline, wherein Norman Osborn is the world’s hero after dispatching of Queen Veranke, the leader of the invading Skrull army, live on broadcast television. Normie is so popular, in fact, that he was able to dismantle S.H.I.E.L.D. and install his own, more evil, super spy organization that the whole world knows about, dubbed H.A.M.M.E.R. (Side note: Though it is clearly an acronym, they literally never revealed what H.A.M.M.E.R. actually stood for. Evidently Osborne asked Victoria Hand to figure it out, and she never got around to it.) He also runs his own dark versions of both the X-Men and the Avengers at this point, but it is the latter who will factor into this book. As for the newly single Peter, though his social life is a bit more open at the moment, his Aunt May is currently shacking up with John Jonah Jameson Sr., which isn’t awkward for Pete at all. Elsewhere, Harry Osborn is getting over his drug addiction by working with his father, Betty Brant is trying to be a reporter, and Norah Winters was still a thing Spider-Man readers had to deal with. Note to all you expectant mothers: Don’t do what Mama Winters did. I know that’s a ton of context to consider, which is probably why many of the creative teams featured in this trade only used bits and pieces of it — if they used it at all. This is both a blessing and a curse, as the arcs that deal with the central Spider-canon (such as the unfortunate “American Son” arc) are probably the weakest in the book. Joe Kelly and a revolving roster of artists try to make the most of the situation, but there just isn’t a lot in issues 595-599 that I found all that entertaining. Going back through old back issues to understand the Peter/Harry Osborn relationship is always a bit of a trip, as for whatever reason, Marvel seemed determined to try and make Harry seem cool and confident, and I don’t feel like I’ve ever bought it. From his ill-advised facial hair choices to his even more ill advised dalliance with villainy, Harry’s always been more of a geeky kid brother than an alpha male. Dude isn’t James Franco or Dane Dehaan, he’s McLovin. As such, putting him at the center of one of Norman’s Dark Avengers plans feels really out of place — which Norman and his crew all call into question, but we’re meant to believe most everyone else thought it was a rational idea. That being said, it is better than the opening arc that focussed on the new Vulture, but that’s neither here nor there. As far as highlights, it’s hard not to love “The Short Halloween,” a one-shotter written by SNL alums (and in-SNL canon married couple) Bill Hader and Seth Meyers. It’s a short one-off focusing on a would be D-list villain that is good for a laugh or two. D-list villains get a lot of love in this trade, actually, as many feature in the Dark Reign Mister Negative series — which is also among the highlights of the trade. I’m not a huge fan of the pencils of Gianluca Gugliotta, but Fred Van Lente lends the characters in the arc a strong narrative voice, and Mister Negative remains the best thing the Spider-Man books have produced in maybe the past 10 years. Sony seems to agree with me. I should briefly touch on the one offs and short stories as well, as they can be terribly hit and miss. Of these brief asides, the strongest is undoubtedly “Identity Crisis,” which is penned by Stan Lee. It’s a real return to form of the character played purely for laughs and is a welcome change of pace for what is, at times, an overly serious affair. It’s especially needed because of the somewhat heavy-handed one-two punch of Mark Waid’s “My Brother’s Son” and Marc Guggenheim’s “The Blessing,” in which we get a quick shot of Uncle Ben being a good father to little Pete and then Aunt May at her husband’s grave asking for his blessing for her pending nuptials to another man. Now I have absolutely savaged Guggenheim’s writing in my reviews of the first several issues of X-Men Gold (and with good reason) but he manages to show some restraint in “The Blessing” and it’s better for it. It’s still a five page cliche, but given the garbage he’s written about space fascists and giant stone gods, this may as well be The Tempest. Thankfully Zeb Wells’ “Fight at the Museum” helps lighten the mood a bit, and features the most overt attempt to depict Jeff “Comic Book guy” Albertson as a member of the 616 universe I’ve seen. Overall, this is an okay read, but not the first one I’d recommend. This book has more of a collector vibe, as in something for those who need to own every Spider-Man trade rather than someone trying to read a story with a meaningful beginning, middle and end. It’s funny at times, a chore to read at others, but at more than 500 pages, it’s not a bad companion for a long flight (or the return trip for that matter). Still, if you’re new to the character or a lapsed fan trying to get back into the wall crawler, I feel like there are a number of better trades that you can spend your time and money on. Yes and no. There are some winners in this massive collection, but most are side stories that are divorced from the central Spidey narrative. This wasn't the best time to be a Spider-Man fan and thus feels a bit under-cooked upon revisiting. This one's for completist fans, not the casuals. A lot of the side stories are fun one-offs that will resonate with readers new and old. Appearance by superstar artists Phil Jimenez, John Romita Jr. and Joe Quesada. A short written by Stan Lee that actually speaks to the guy's talent! There's a TON of content to read if you're a fan. The Vulture and American Son arcs are pretty crappy. The book is probably too long. Most of this doesn't work together thematically or in-canon.